UK greenhouse gas emissions fell by more than 8% in the last year, while renewables accounted for a fifth of all UK electricity, according to provisional numbers released today (26 March) by DECC. The standout figure in the Government's 2014 emissions report was an 8% drop in total emissions, reportedly driven by greener energy generation. This was because renewables generated a record 19% of the UK's electricity in 2014, rising to 22% in the fourth quarter of the year. Meanwhile, the latest quarterly energy trends report, also released today, shows that wind power was once again the leading green technology, accounting for around 63% of the renewable contribution. Responding to the figures, RenewableUK deputy chief executive Maf Smith said: "It's wonderful to see renewable electricity reach another record of 22% of electricity generated and to see wind providing the lion's share of that. "Onshore and offshore wind is a UK success story, and as the General Election approaches, politicians should recognise its value, and support it fully". 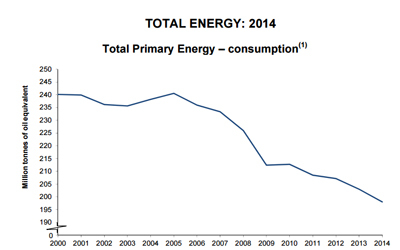 The new statistics also highlight another fall in total energy consumption, continuing the UKs downward trend since 2000. Final energy consumption was 5.6% lower than in 2013, with domestic consumption falling by 14%, partially thanks to efficiency upgrades as well as warmer temperatures. Energy efficiency and increased renewable generation were identified as reasons for the UK emissions drop, but the downward trend was also helped by reducing use of coal-fired power plants. Chief Scientist at Greenpeace UK chief scientist Dr Doug Parr said :"Last year UK carbon emissions fell dramatically whilst the economy grew faster than it has in any year since 2007. This is further evidence, if it was needed, that efforts to cut carbon pollution and boost our economy can go hand in hand. "And since a reduction in coal use was a crucial factor in bringing down CO2 emissions, these figures give us a taste of what could be achieved if our political leaders got serious about phasing out the dirtiest of all fossil fuels and gave proper backing to clean energy. This should be a key learning for ministers as they prepare to set out their carbon reduction plans ahead of a crucial climate summit later in the year." Friends of the Earth (FoE) also welcomed the news, adding that it should encourage Government to be more ambitous in transitioning to a low-carbon economy. FoE campaigner Guy Shrubsole said: "Such a sharp drop in emissions in one year is encouraging news. Clean solar and wind power are skyrocketing as prices continue to tumble. But this doesn't mean we should rest on our laurels - the Government should build on the momentum and set more targets for getting off fossil fuels faster." The numbers revealed that carbon dioxide emissions - which account for around 80% of all UK emissions - have fallen by almost 10%. Richard Black, director of the Energy and Climate Intelligence Unit, commented: "A steady stream of news this year suggests that the prize of decoupling growth in greenhouse gas emissions and economic growth is in sight. 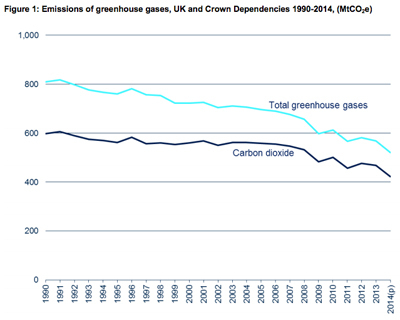 “The finding that UK emissions of carbon dioxide fell 9.7% in 2014, the largest drop on record for a country with a growing economy, is remarkable. “Combine this with the recent news that globally CO2 emissions did not rise in 2014, the first time this has happened in 40 years without an economic crisis, and something significant seems to be happening." Delve further into today's figures with five graphs showing reasons for optimism!